Like his customers, Chef Amoroso enjoys the meals at Michael Mina at the Bellagio. He admits, however, that the best and most important meals he's ever had have been Sunday dinners at his grandmother's house. "My grandmother pretty much cooked to perfection on a regular basis," he says. "My dad was one of those guys who liked to be early for everything so if we were supposed to be at Grandma's house at 2 p.m., I was there at noon. So what did I do for two hours? I sat at the kids' table in the kitchen and watched Grandma. I didn't realize how much of an impact it would have until later on. The basis of your palate is formed when you are a child, so I think those were the most important meals of my life." Although his grandmother's meals were his favorite, he looks up to Michael Mina. "Obviously I admire Michael," he says. "The fact that he does spend time in the kitchen, he knows what it still feels like to be a chef. A lot of those guys build a restaurant empire and kind of lose that part of it, He doesn't. I would be willing to bet you there aren't many people in his position that could walk into their kitchens and run them tomorrow. It's pretty amazing. It's what you aspire to be." Of course, chefs aren't the only ones with aspirations. Their customers have them, too, "I think - hope that it will be - that people become more concerned with where their food comes from," he says. "You can get a pear 12 months of the year; that doesn't mean that it's good for 12 months." Chef Amoroso points out that it's becoming more affordable to eat natural. "Going to Whole Foods is a big day on the credit card for some people, and it doesn't necessarily have to be that way," he says. "I think that little by little it's starting to change. In the restaurant world it certainly is. We're seeing more organic farmers produce more organic product, more organic meat, more organic poultry." Of course, if you can't eat well at home, there's always Michael Mina Bellagio. To read more about Michael Mina at the Bellagio, please click here. If you'd like to see one of Chef Amoroso's recipes to try in your own kitchen, please click here. 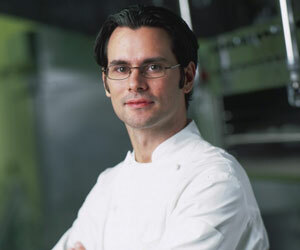 Or, if you'd like to read more about Chef Amoroso, please click here for his biography.